NOTE:- This is not a how-to. I don't know what I'm doing. Yet. I haven't tested anything either, just taking notes today. To be honest my past experience with Microsoft Visual SourceSafe, Rational ClearCase, and even Subversion is that, while the idea of separating concurrent streams of work into branches makes total sense, in practice branching and then merging branches is a difficult, error prone and risky operation! So, that's where I'm coming from. My notes here are what I'm exploring online to try and get somewhere with branching that's not like that. I used to HATE Git. I still do hate it's command-line interface, but Magit makes it a joy to use, and exposes the many weird and whacky functions of git in a way that you can begin to understand it. It's reference manual is pretty darn awesome too. All the cool kids use Git, including my workplace. I'm starting to get used to it. Doing my own projects with it helps a lot. I've been reading the Magit User Manual, and the Git bible: Pro Git. 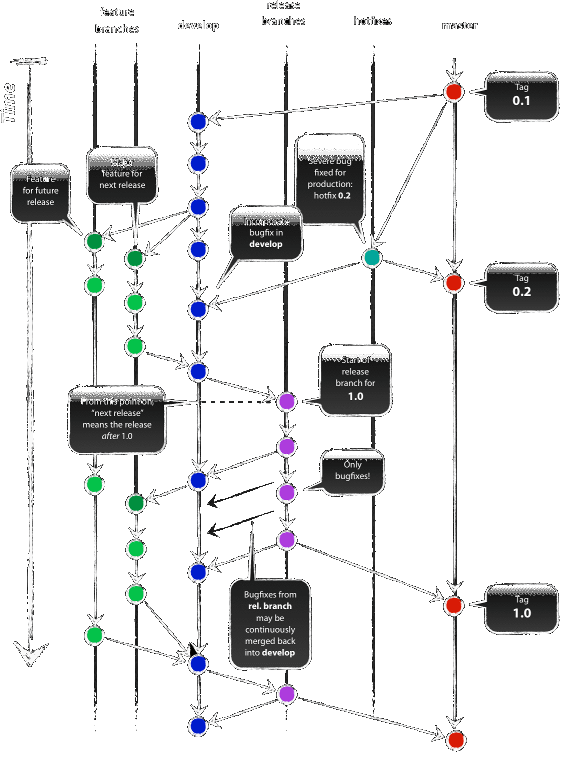 The chapter on Branching has some example workflows but doesn't try to proscribe a particular one, which makes sense. Now, though, I'm looking for some guidance on policy, not just mechanism. Step 1, what are some workflows people use? I like it a lot, actually, and will read it through properly. 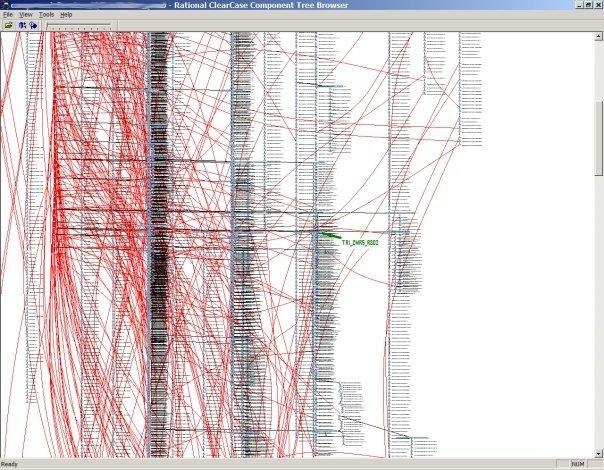 At first glance it's a lot like the GitHub Flow (which I've also only skimmed). Vincent Driessen documents a successful git branching model that looks attractive. Driessen uses two long-lived branches (I think like those mentioned in Pro Git). These are short-lived branches that end either by merging to develop or by being removed (dead-ends). Typically exist in local/developer repos, not in origin. b l [el] (magit-branch-checkout), enter a new branch for "myfeature" and then pick "develop" as the starting point. I like the --no-ff: always creates a new commit of the merge, not fast-forwarding. So, because of the non-fast-forward, you can still see the branch in the history, even after you delete the branch. I'm not sure what this next bit means, exactly. It seems to be concerned about remotes though, so it probably doesn't matter for local branches? This is where you do last-minute "dotting of i's and crossing of t's", or for merging in minor bug fixes before merging the release → develop → master. $ git commit -a -m "prepared release version 1.2"
b l (magit-branch-checkout), enter a new branch for "release-1.2" and then "develop" as the starting point. b b (magit-checkout) and choose "master"
m m (magit-merge) and choose "release-1.2"
t t -a (magit-tag) and enter "1.2"
b b (magit-checkout) and choose "release-1.2"
m -n i (magit-merge-into) and choose "develop"
Or "hotfixes", but whatever. They're changes that need to be made to master after a release tag. So that's a bug. Short-term branch. I guess the bug's "hot" because it can't wait for it's turn in the develop stream. I made a small change to the naming here, because Driessen's examples are confusing to me: surely you'd name your bug or "hotfix" branch after the issue number, not the future release tag? $ git commit -a -m "vesion 1.2.1"
make the fix, test etc. $ git commit -m "fix servere production bug ABC"
c c -a (magit-commit), enter "version 1.2.1"
Need to merge into master, but also into develop, to keep the fix in the development stream. Same as a release, except if there is a current release- branch, then merge back to that instead of to develop. m m (magit-merge) and choose "bug-ABC"
t t -a (magit-tag) and enter "1.2.1"
b b (magit-checkout) and choose "bug-ABC"
m i (magit-merge-into) and choose "develop"
There's more than one way to skin this cat. This is one way, I like it, I'll look at more. The only difference between a "long-life" branch and a "short-term" is that you delete the short ones with git branch -d <somebranch> (or (magit-merge-into)), but leave the long-term ones alone.